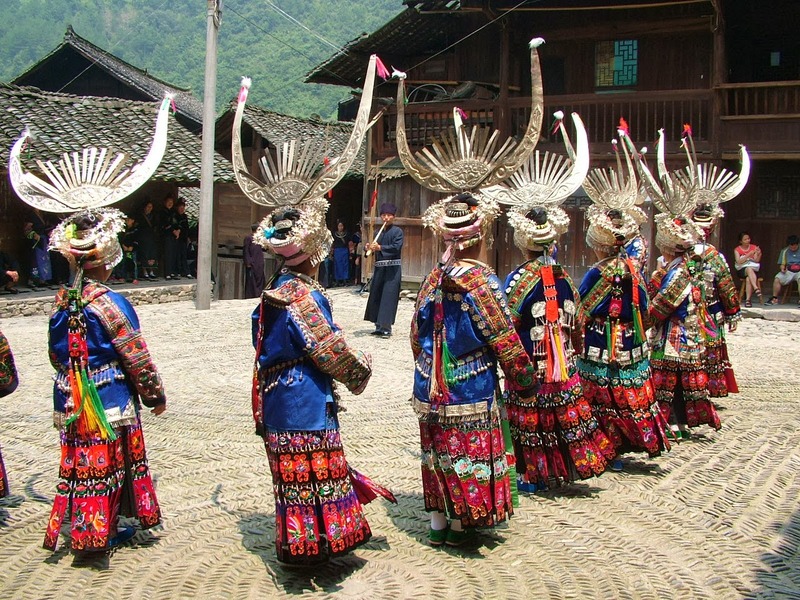 Women in Upper Jidao village, Guizhou, wear their festival attire and perform Miao songs and dances for tourists. Photo by Jenny Chio. While most of the world has been dazzled by the transformation of China’s cities in recent years, Emory anthropologist Jenny Chio has been quietly recording changes in the rural way of life. Her documentary film “农家乐 Peasant Family Happiness” explores the impact of tourism in China, from the perspective of residents of two rural villages where urbanites go to seek a “country” experience. The film, which won the 2013 David Plath Media Prize from the Society for East Asian Anthropology, is getting good reviews as it makes the rounds of conferences and festivals. In May, Chio has a book coming out, “A Landscape of Travel: The Work of Tourism in Rural Ethnic China,” which will give more details about the impact of touristic desires on village life, while also delving into the visual politics of tourism and photography. Chio was born in the United States, to parents who immigrated from Taiwan in the early 1970s. She was raised in the Midwest and California and speaks Mandarin Chinese. As an undergraduate majoring in anthropology at Brown University she became interested in museums, particularly those run by Native Americans, and how they are used to address historical trauma and promote revitalization of cultural heritage. She cites a running joke: Reports of Chinese tourists going to Europe and the United States and being disappointed that the cities look so old and decrepit in comparison. In this still image from "Peasant Family Happiness" a village woman muses whether she should maintain an "ethnic" look while doing her household chores. 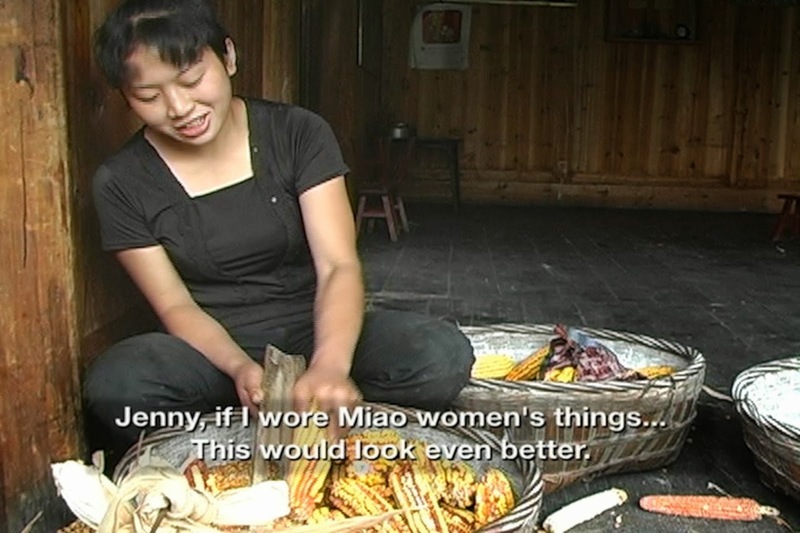 Chio began filming the villages in “农家乐 Peasant Family Happiness” in 2006 as part of her thesis for a PhD in socio-cultural anthropology at the University of California, Berkeley. Domestic tourism is booming in China. As the middle class has blossomed in cities, the government has promoted tourism in the countryside, to help address the vast economic disparities between the urban and rural populations. The term “peasant family happiness,” or nong jia le, became a catch-all phrase to describe the phenomenon of homestays and guesthouses where “city slickers” can unwind while enjoying local food and activities. Chio turned her camera on two ethnic minority villages cultivating tourism in their largely agricultural and wage-labor economies. The first, an ethnic Zhuang village called Ping’an in the terraced rice fields of mountainous Guangxi Zhuang Autonomous Region, has been on the tourist map since the 1980s, due to its dramatic scenery. The second, Upper Jidao Village in Guizhou Province, is an ethnic Miao community with a quieter beauty. Set at the foot of a hillside in front of a river, Upper Jidao was just beginning to transform itself into a tourist destination when Chio started filming. 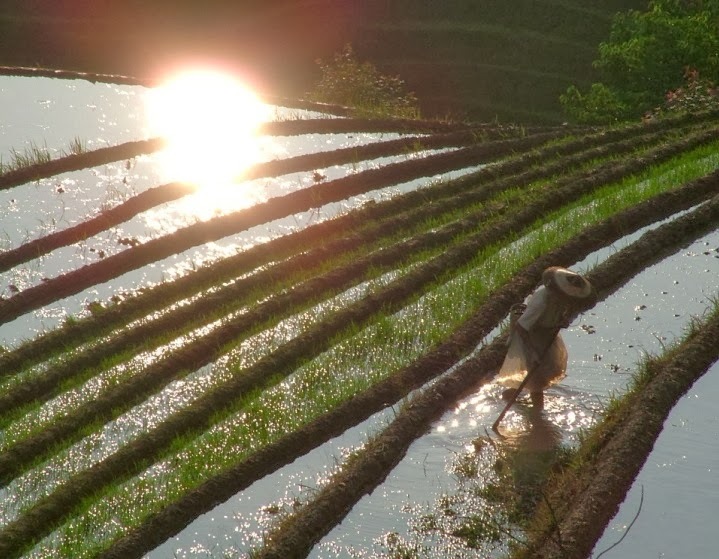 A villager at work in a rice field. Photo by Jenny Chio. The tourists may want to have a cultural experience, but they don’t necessarily want it to include strong smells. In order to create a guesthouse, village families must consider whether they need to move their pigs away from their traditional location, beneath homes, to pens further away. A flush toilet and indoor plumbing, uncommon luxuries in many villages, are basic essentials for city folk. Windows may need to be screened, and a balcony added to a room to make it more desirable. A concrete house may be more practical, and less of a fire hazard, but a wooden home is more picturesque. 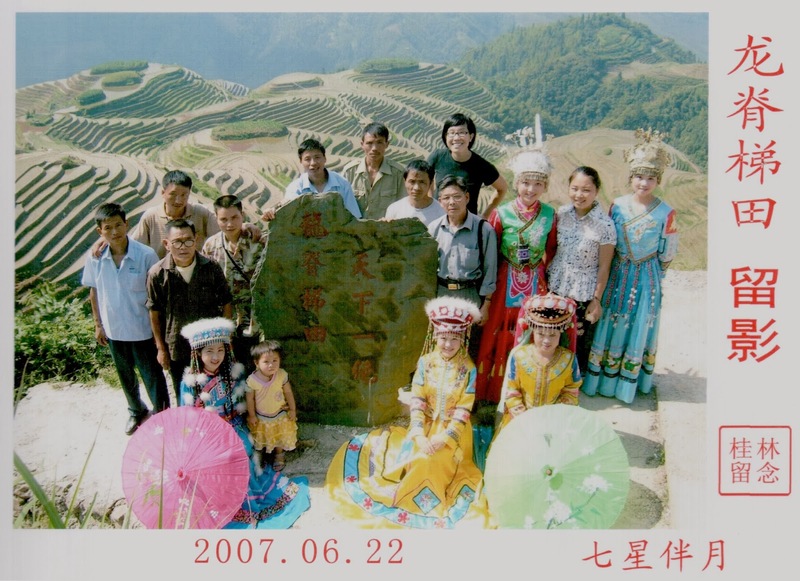 Residents of Upper Jidao and Jenny Chio pose with "minority models" for a souvenir photograph in Ping'an. As more village youth graduate from college, rural tourism gives them an opportunity to return and run a hotel or other business. “They may help their parents create web sites for a guesthouse and build networks with travel companies,” Chio says. China’s population recently tipped for the first time into a predominantly semi-urban-to-urban one, but 49 percent of the country remains rural. “Rural China sits at the heart of a lot of key issues that the government has to deal with,” Chio says, including political instability at the local level, the critical need for food security, population mobility and tensions between the “haves” and “have nots.” The rapid urbanization of China has put more pressure on the government to help the countryside catch up. Chio’s next project is focused on the digital technology and media practices of rural China. In some areas, non-governmental agencies have been training villagers in video production. The videos appear to have varying aims, from fostering awareness of social issues and environmental problems to simply offering glimpses of local festivals and other events.